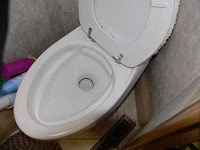 The RV Doctor: Surprise Blockage in RV Holding Tank Drain! Surprise Blockage in RV Holding Tank Drain! Robert, it's literally impossible for that cleaning brush to ever get past that first 45-degree elbow in the toilet drain. In this instance, it's actually a good thing your toilet drain has that bend in it. If it was a straight drop from the toilet into the holding tank, it would be more difficult retrieving it from the holding tank itself. You'll simply have to cut through the 3-inch ABS drain pipe a few inches above or below the uppermost 45-degree elbow fitting. You may have to sacrifice the brush itself in doing so, but chances are you wouldn't be using that brush again anyway! Depending on how easy it is to flex either the upper or lower section of the drain pipe after the first cut, it may also be necessary to make an additional cut in the ABS piping on the opposite side of the elbow. Making two cuts will enable you to remove that section with the brush completely and then, easily remove and discard it. Then simply cement two, 3-inch ABS couplers to reconnect the toilet drain piping. It may be difficult to install the 2nd coupling if there's not much give to the drain pipes. If that is the case, it may be easier to install a Calder-style coupler (see photo), instead of a glued-in fitting. A worst-case situation may mandate removing toilet and floor flange in order to reassemble all the pieces correctly. It's amazing what gets dropped down the toilet and into the holding tank; none of which is a good thing. As you found out, it definitely causes blockage issues. I even had one reader wonder how to remove a set of dentures from the solid waste holding tank! Yikes!